Censored in the U.S, Revealed by the British Press: This is What Romney Does to American Workers. “I understand business needs to make a profit. But this product has always made a ton of money. It’s just that they think it is not enough money. They are greedy,” said Tom Gaulraupp, who has put in 33 years at the plant and is facing the prospect of becoming jobless at the age of 54. Mark Shreck, a 36-year-old father-of-three, confessed he was one of the few workers not surprised at the layoffs, as this is the second time his job has moved to China. “I feel this is what companies do nowadays,” he said. The Freeport workers have appealed to Bain and Romney to save their plant. The local town council, several Illinois politicians and the state’s Democratic governor have all rallied to their cause. “This company is competitive globally. They make a profit here. But Bain Capital decided to squeeze it a little further. That is not what capitalism is meant to be about,” said Freeport mayor George Gaulrapp, 52, pictured. President Barack Obama’s campaign has sought to make Bain’s record of buying and selling companies – often involving job losses – a key part of its strategy of painting Romney as an out-of-touch super-rich financier. In turn, Romney, who left Bain in 1999, has defended his long career there, saying Bain ends up generating economic growth and spurring job creation. Far from profiting from layoffs, Romney has portrayed Bain as a model for the American future. That argument stuns Illinois governor Pat Quinn. “If he thinks that is the model for American economic growth then he is barking up the wrong tree,” Quinn told The Guardian. Of course, no one at the Romney campaign wants to be linked with the Freeport plant closure. “Governor Romney is not familiar with this issue and has not been involved in the management of Bain since 1999,” said campaign spokeswoman Amanda Henneberg. Nor does anyone at Sensata want to discuss the social costs of their decision. “We don’t have any statement on the impact it has on Freeport,” said Sayer. Bain did not return a request for comment. The loss of 170 solid well-paying jobs will ripple out into this economy, further straining city resources, hurting businesses and eventually adding to Freeport’s foreclosure problem. “There is a sense of fright. People don’t know what this means for their families, their health insurance and whether they will keep their homes,” said mayor Gaulrapp. 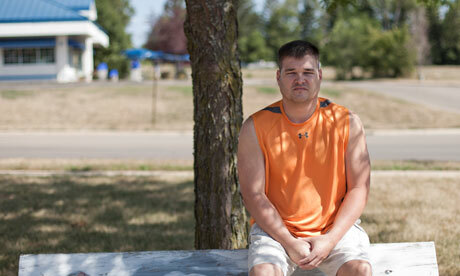 Tom Gaulrapp – no relation to the mayor – worries he will be homeless. “It is a real possibility,” he said. Randecker’s daughter has already quit nursing college in Iowa to save money. Joanne Penniston, 35, is wondering if she will have to leave town. “I would have to uproot my whole family,” she said. Dot Turner, who joined the firm when she was 18 and freshly married and then put in 43 years on the factory floor, has suddenly found long cherished retirement plans thrown into disarray. She is 62 and knows finding another job will be tough. “I should not be standing in an unemployment line at this stage of my life,” she said. Turner too finds it hard to hear Romney talk of creating jobs when the post she has worked at for four decades – and which paid for three children to go to college – has just been sent overseas by a firm majority-controlled by Bain. “When Romney talks about creating jobs, it is just a big fairy tale,” she said. There is little chance of a happy ending for Freeport. The workers collect petitions and hold demonstrations. But they know they are likely doomed. “We are not stupid. We know we are unlikely to save our jobs. But if we get the next company that tries it to think twice, then maybe we save our neighbour’s job. Or our children’s,” said Tom Gaulrapp. Meanwhile, bit by bit, the machines inside the Freeport plant are being packed up, beginning their long journey to China. By the end of the year it will be over. “It is kind of like part of your family being shipped out – I worked with that stuff for years. Now there’s nothing left but a discoloration on the floor where the equipment used to sit,” Gaulrapp said.